Only 12 Ep?! That isn't enough! Should you watch this anime? Yes, it is such a great anime. One of the best I've ever seen. I haven't read the manga or anything like that but the anime itself is great! For those of you leaning on the fence if you should watch it, it's a must. It is a psychological anime but I won't tell you anything else or it will spoil it! Don't read anymore reviews or anything about it! Just watch it! This show was amazing. Awesome opening, animation, and tense moments. The only negative about this show imo is that the show could have done so much more with the demons/ outside world being dangerous aspect. The whole show is nothing but one big prep phase for an eventual escape, so I wish they could have escaped a lot earlier in the show so we could see more interesting stuff like the group going through hardships in the outside world, or encountering demons that capture them. Sadly, none of that is there. This is an absolutely stunning anime with a brilliant story line. I recommend this greatly to anyone that loves dark twists and thrilling story lines. The character progression in this show is incredible and it was amazing to see how much some characters actually changed. Brilliant. Smart, twisted, and intense. TPN is a masterclass in story telling. Usually in anime, it takes me a good couple episodes to get invested. I have to watch maybe three or four episodes in order to feel the characters and truly get a grasp of the world they live in. But in The Promised Neverland, that slow pace of getting to know the characters and feeling iffy on the series, comes to a screaming crash at the end of episode one. Which made me audibly go "WHAT?" and click next episode without thinking. I binged the whole season last night. So here's my review, fresh in my mind. I will say some minor spoilers in this review, but anything major is hidden by a spoiler alert, so if you need a confirmed 'yes' or 'no' I stand firmly on the 'WATCH IT NOW' choice. So go on and binge! It's extremely worth while! -Sister Krone's character design is unsettling and stereotypical. I'm not going to go on a long speech about it. All I'm saying is that it's blatantly stereotypical. Is it intentional? Probably not, but if you care about that kind of thing- then be warned. It made me a bit uneasy about the character, and I wasn't really okay with how she was portrayed, but that's my ONLY gripe about the show. -Animation quality is amazing! Both in regular 2D style and 3D CGI. Yes, I said CGI. I don't quite know if it's exactly that, but the usage of 3D animation blending in this show is perfect for a thriller/horror anime. It looks GOOD. Not cringe worthy or joke worthy. It's genuinely good animation with good use of 3D art, and you're sure to love it. Even the detail within the faces are amazing and can tell you a lot- without revealing a lot. -The story is unique and captures attention at every turn. I went into this anime playing checkers, only to be confused when I finally realized I was supposed to be playing 4D chess while riding a roller coaster. The plot twists are plentiful, but not needless. Every twist can be traced back to an earlier point in the show. Making you go "WAIT THAT'S WHAT THAT MEANT?" or even details in the scene can hint at future events. It's a show that is smart about it's plot twists- not adding them in just because they need a shocker. This alone makes me constantly think about what's coming next, and makes me fully invested in what I'm watching. -The protagonists are likable and smart. The whole show is a cat and mouse metaphor at least in this season. Can the mice outsmart the cat? Or will the sneaky cat with patience persevere? Both the protagonists and antagonists in this show are insanely clever and smart. Making it all the more interesting. Someone has a solution for one problem, only to be thwarted by the other character- but WAIT, they thought about that! So there's an alternative! But no, that won't work.. then how about this! The show constantly makes you think about solutions to problems, how the characters can make it out of this situation, and ultimately make you wonder- how can they truly escape? With their intense refusal to give up, you'll want to root for these characters- but also want figure out how they came up with such clever and smart ideas. -The tension and anxiety feeling is spot on. My review is getting ultra long, so I'll make this and my last point quick. This show is a thriller. It's suspenseful. And it's anxiety inducing. It works well because of all the previous points I mentioned, and it's one of the absolute best anime in this area that I've seen to date. If you like the intense, anxiety inducing, uncertain feeling- then this is your show. they find out that all the kids before them were sent out. To be eaten. By massive demon like creatures. And the first episode shows a six year old girl dead in a truck. Yeah, wow. The deaths, facial animations, dark colors, and intense story make this show dark and twisted. And the nice reality that you thought was there in episode one quickly vanishes when you realize that it's not what it seems. Can these three protagonists (and supporting cast) make it out alive? Or will they meet their end in a world filled with darkness? Watch the show to find out. This is by far one of my favorite shows in recent years, so I highly recommend it. We're guaranteed a season 2, but the ending of season 1 was still satisfying. This review was long, but if you read it all, thanks! I hope you take a chance and watch the show, because I loved every episode. I held off watching it, but I don't recommend you hold off on it. It's worth it. I enjoyed this show immensely. I've recommended it to several friends who had the same reaction. I was intentionally going to watch only one episode. Before I knew it, I had watched all 12 in 2 days. If you like psychological stories with a twist of horror, then you are definitely in for a thrill ride with this anime. The premise of the show is really good, it kind of reminded me of maze runner, except a million times better. The characters had this depth to them that was really amazing, their interactions and flaws were great, the subtle hints and explanations were awesome, the twists and smarts of the show were unexpected and good. by the end of the first episode i was hooked, i instantly felt the vibe and the plot that it was gonna take. a weird twisted turn. and later on through the show that happened and it was really good. especially since one of the characters is voice acted by the same voice actor as killua and it just makes it even better. its really good i recommend. im trying not to spoil it so just watch it. This anime is just the kind of thriller/horror that I like to see. The concept feels new to me, and the opening is one that has been stuck in my head for days. Each episode ends with a cliff-hanger, making you want to immediately watch the next one. Can't wait to see what is next! and how to escape their almost inevitable deaths due to the harvest. Throughout The Promised Neverland, the author of the story intentionally leaves out many details and aspects of various scenes, building up a big twist later in the series. It was done so well, that I found myself being surprised almost every episode, and needed to know what was going to happen next. "Mum, why did you give birth to me?" The Promised Neverland definitely has its promises for the upcoming seasons, and I can't wait till the next season. The excellent execution of plot twists, tightening tension, dynamic dialogue really brought this series together, making it my favourite anime I have seen to date, and on edge for 2020 when the next season comes out. All in all, The Promised Neverland holds many fantastic aspects that makes itself unique, and the outstanding storyline just adds that special sauce to it all, giving me a ride of a lifetime. 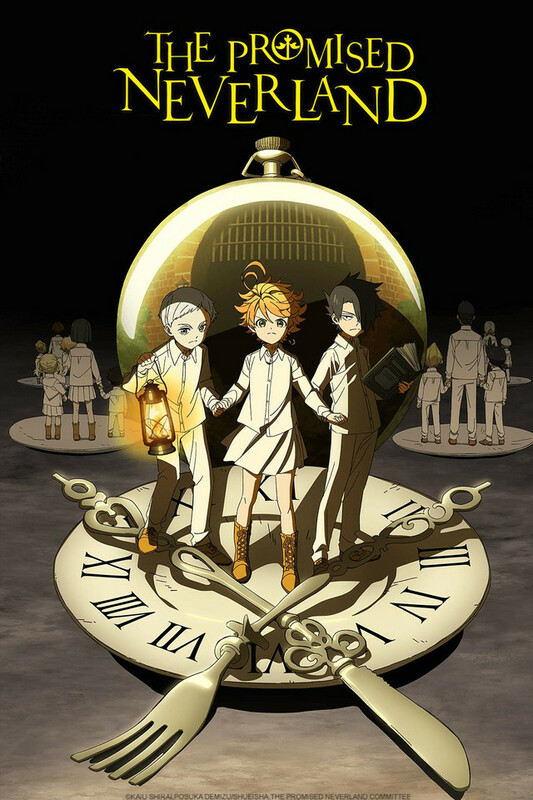 I highly recommend The Promised Neverland to anyone, even if you are not a big fan of horror as I wasn't as well.